There’s a good reason why so many people choose Lake Tahoe as the place to spend their well-earned time off. Between its peaceful mountain ambiance, its abundance of fun and exhilarating activities, its breathtaking natural sights, and of course, the shimmering waters of the lake itself, Lake Tahoe is the perfect place to escape into the fresh alpine air, far away from the daily stresses and worries of life. Fortunately, Tahoe Signature Properties has a myriad of Lake Tahoe lakefront rentals, all situated alongside the exquisite beauty of this enormous mountain lake. 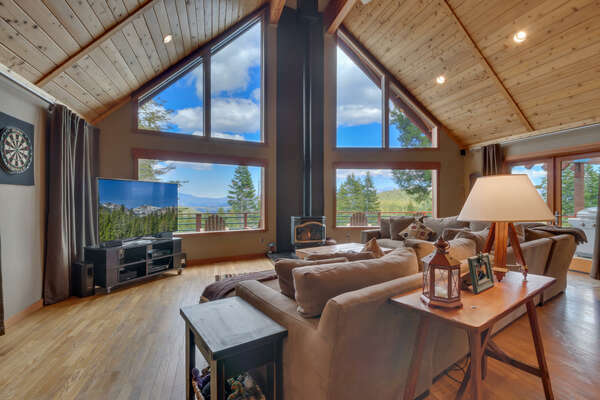 Read on to learn more about the Lake Tahoe lakefront vacation rentals that we have available here, as well as how they can add a special touch to your vacation memories. These charming homes showcase a cross between homey, rustic touches and contemporary elegance. Superior wood- and stonework characterize the interiors and exteriors of these Lake Tahoe lakefront cabin rentals, including cozy stone fireplaces and high-end handcrafted wooden furnishings. Open floor plans take full advantage of space for the ideal home away from home, where you can relax in the privacy of your own room or entertain many guests in the living and dining areas. Natural light floods into these homes through the wide and numerous windows in a profusion of cheerful sunshine, brightening rooms and moods. Fully-stocked gourmet kitchens, complete with granite countertops, top-of-the-line appliances, and an array of cookware and utensils serve as a place to prepare and share meals and memories together. Resort-style bathrooms afford ample space and privacy for your daily routines. From the backyard and open-air deck lounging areas, you can gaze out over Lake Tahoe in all of its glory, stretching far into a horizon punctuated by idyllic snow-capped mountain peaks in the distance. Truly, these Lake Tahoe lakefront rentals bring you the best of Lake Tahoe. When it comes to winter sports up on the mountain, sledding comes close second after skiing. The hills on Lake Tahoe have everything you could possibly need. Powder snow, easy ride, and smooth lanes. Many of the ski areas around here such as Northstar California Tubing Hill, Tahoe City’s Winter Sports Park, and Grandlibakken Tahoe Sledding Hill among others will offer tubes and saucers for free or for rent. So make sure you check the rules before you head out the door of one of our Lake Tahoe lakefront vacation rentals, since not all resorts will allow tubes or toboggans on their premises. Another winter sport that is favored by tourists of all ages, shapes, and skill levels, snowboarding attracts visitors from everywhere. Even athletes come to enjoy the challenging experience and the amazing powder snow. In fact, this area has produced many Olympic champions who all started their skiing and snowboarding on these hills at a very young age. And since most of the ski resorts are found on the north shore of the lake, you’ll have plenty of options to choose from when staying in one of our Lake Tahoe cabin rentals on the lakefront. Most resorts offer training and lessons for those just getting started. North Lake Tahoe is famous for being an oasis of culture and arts, both visual and performing arts. It’s one of the very first things you’d notice as you walk down the quiet streets of the town. Art galleries are everywhere you look. Most of the displayed work is by local artists who get a lot of inspiration from the lake. Also, theaters offer a wide variety of plays that include Shakespeare Revivals. You’ll also get a chance to take home a piece of sculpture or a painting that works both as art and a souvenir of your Tahoe vacation. Contact our dedicated reservations team to start planning the vacation of a lifetime today when you reserve your stay in one of our glamorous Lake Tahoe lakefront vacation rental properties or elsewhere throughout the Northern Lake Tahoe and Truckee area!